The EU's carbon trading scheme has increased electricity bills, given a windfall to power companies and failed to cut greenhouse gases, it is claimed. An investigation by BBC Radio 4's File on 4 programme has found that after two and half years the scheme has yet to cut in carbon dioxide emissions. But a government minister has promised that the scheme's next phase will be a big improvement. The EU's Emission Trading Scheme - a key part of the UK Government's drive to combat climate change - began in 2005 and created a trade in carbon allowances. And according to one government estimate, that delivered windfall profits of up to £1.3bn to the generators in that year - higher than environmental campaigners had claimed last year. 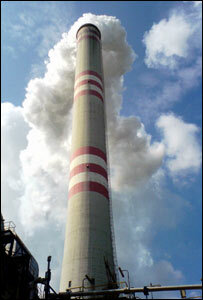 The chief executive of Energywatch, Allan Asher, said , "Consumers increasingly accept the need for reductions in carbon. "However they are paying the price and not seeing the benefits. The big generators are banking huge amounts of money and consumers aren't benefiting." "If you are saying to me it hasn't achieved a massive amount so far when it comes to CO2 reductions, well I agree with you and I think Phase Two will be a big, big improvement...and a key instrument in helping us all to achieve our carbon reduction targets across Europe."